WELCOME! to Southern California’s premier source for wonderful wedding ceremonies customized especially for you. From the simplest celebration to the most luxurious, you’ll delight in a joyous, stress-free ceremony perfect for the two of you. Discover how easy it can be to have the wedding of your dreams – romantic, fun, inspiring, unforgettable. Contact Rev. Leslie and let the magic begin. Thank you for making our wedding a truly wonderful experience... ...definitely a once in a lifetime moment. The service you performed was simply magical and so very romantic. The wedding ceremony you performed was wonderful from beginning to end. Thank you for everything! Thank you so much for giving us such a beautiful ceremony. It was truly wonderful and memorable. Thank you. Jonathan and I got so lucky to have found you! You were awesome! We were so happy with everything and our guests actually thought you were family, because of how sweet and personal you were. It was so nice not to have to worry about any of the paperwork. Everything was perfect! Thanks again for helping us create the most wonderful and totally personal ceremony. We could not have done it without you and you deserve a gold star for helping us pull off the most spectacular wedding! Thank you for such a fun ceremony. It was beautiful, and we could not have planned it so nicely without your help. You are a joy and a delight to work with! Thank you for your caring, patience, all your creative ideas, and for all the energy you put into our ceremony. Most of all, thank you for your constant support in helping to make this day so special for us. Thank you for your beautiful and moving ceremony for our wedding. You helped make our wedding a very special occasion, and we feel that we are blessed at the start of our married life. Your presence and loving energy made it all so special and filled with joy. I feel so fortunate to have met you! Thank you for making our hand-fasting so magickal. Blessed be! I've been to many a wedding in my life, but I don't believe I've ever witnessed one that was so warm and sweet, so meaningful and touched with happiness and moments of fun. Thank you so much for all that you have done for us, and through it all you have been so loving, supportive, encouraging...and absolutely delightful. What a blessing that Jared and I connected with you from all the rest to officiate for our ceremony.... We knew you would do a spectacular job! The ceremony was beautiful and we loved that it seemed different and unique from most wedding ceremonies. We got lots of compliments on how wonderful you were and how beautiful the ceremony was. Thank you again for making our wedding day so special. It's almost been a month and I'm still so amazed at how beautiful everything was. Thank you so much for creating such a perfect ceremony. Everyone complimented us on how unique and touching the ceremony was. You are such a treasure. Truly the perfect person to unite us in marriage. Thank you again so very much. Thank you so much for the beautiful wedding ceremony. We have had so many compliments. So many people were on the edge of their seats. Great job! I wanted to thank you so much for our beautiful ceremony last week. We really had the best day! It was exactly how we wanted it. Thanks, Leslie! ...I loved that we could create our own special service. Thank you for helping us create a wonderful and memorable day. We wanted to thank you -- from the bottom of our hearts. How lucky we were to have found you! We had the MOST wonderful time getting married....Thank you for being a part of it. Jimmy and I want to thank you again for all your help in making our day a lot easier! Also for working with us on such short notice. A special thank you for your amazing skill and insight into the planning of the ceremony....Thank you so much for everything -- you will forever be in our thoughts and memories of our special day. Bryan and I are doing great and are so happy! Our wedding was perfect and so much fun. Our families had a good time and everyone remarked how beautiful and special our ceremony was. Thank you so much for making our special day so perfect. After celebrating our first anniversary Matt and I wanted to take a moment to write and thank you again for such a beautiful wedding ceremony. I can't count the number of times this year that I have been complimented on our ceremony by friends and family. Thank you so much for such a wonderful memory. Thank you so much for performing such a beautiful ceremony for us. Everyone was so moved by our inclusion of Carly [the bride's 5-year-old daughter]. Thanks again for making our wedding day so memorable. Not only do I thank you for performing a wedding ceremony with less than 24 hours notice, but I thank you for making it so special. Although I had only spoken to you the day before, I felt as if we had known each other for a long time. Jeremy and I really had our hearts set on getting married New Year's Eve, and thanks to you, we were able to. We want to thank you for all your wonderful help. You are the BEST! We want to thank you again for performing our parents' renewal vows -- you were amazing! You helped make the night unforgettable. We're all still talking about it! Thank you for the lovely ceremony. You really made it special for the two families. Danny and I are celebrating our 3-month anniversary today and have been reminiscing about our wedding day. I thought it would be a good time to write you a note thanking you for the beautiful ceremony you put together for us. The evening was perfect and you helped make it that way. Thank you so very much for the beautiful ceremony you performed for Gaye and Tom. The lei exchange, Hawaiian blessing, and rock ceremony were wonderful and memorable. You truly made Gaye and Tom's dream wedding come true. Mahalo nui loa. Thank you so much for such a lovely ceremony -- we received many, many compliments! We were so happy to have you as our wedding officiant, and will always look back on that day with joy and love. Aloha. P.S. Thanks for handling the paperwork. The marriage certificate arrived promptly. Thank you for such a magical and beautiful ceremony!! Your work is truly wonderful. We enjoyed working with you very much. Wayne and I can't thank you enough for the beautiful ceremony you provided. Thank you for all the help with our paperwork too! We want to thank you for making our wedding day soooo special! We will cherish those vows forever. Thank you so much for the beautiful ceremony. Ken and I will always be grateful to you for helping to make our wedding so special. Thank you for handling so many details so we didn't have to stress over any paperwork! We just wanted thank you for the very beautiful ceremony! You helped make this day so special for both of us and we can't thank you enough. Your kindness showed in all you did and the wedding couldn't have gone more smoothly. Hope you like the photos as much as I do! Thank you for everything. You were great, and made the process easy! © 2019 Rev. 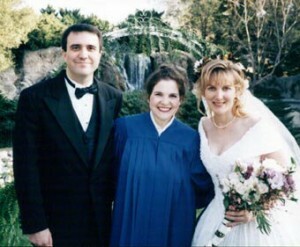 Leslie Bockian || Non-Denominational Minister || Weddings, Commitment Ceremonies, and Renewal of Vows in all 50 States.